Some Indonesiaful News – Where in the world is Kelly? 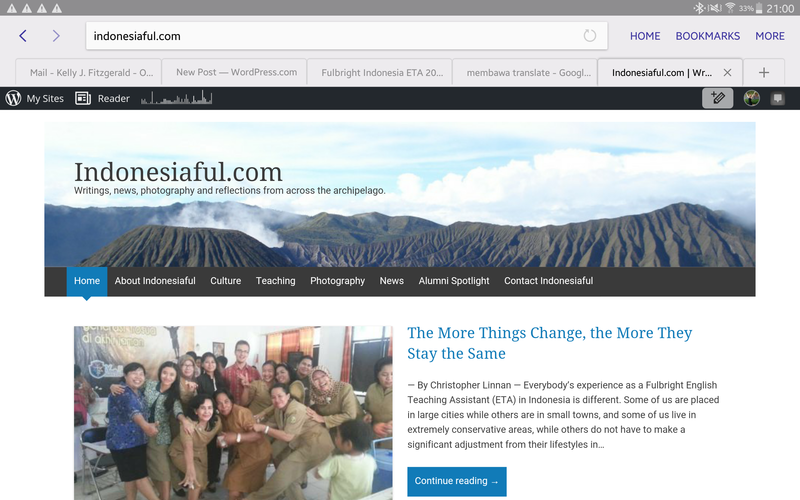 Indonesiaful.com — check it out! During orientation, I received some exciting news from Chris Linnan, a returning ETA, that I was chosen to be Co-Editor-in-Chief for Indonesiaful.com during the 2015-2016 grant period. Indonesiaful was started in 2012 by a then-ETA and has been maintained by current ETAs ever since. As the title implies, I will be co-editing the website with Chris. Indonesiaful is run on WordPress, the same host as this blog as well as the blogs from my 2013 circumnavigation adventures. I have already been tweaking with it behind the scenes, though I published the first post of the 2015-2016 year last night. Chris and I will both be soliciting articles (fellow IndoFulbrighters: if you are reading this then I’m talking to YOU) and editing/creating content, but I will be in charge of posting and general site maintenance. I’m not exactly a WordPress expert, but I will definitely be well on my way after this year. In the last couple of weeks I have been bursting with ideas of things to do with Indonesiaful, both in regards to content I would like to see and formatting changes that I want to experiment with. It is a grand new project that I am delighted to have, and it has also made me wonder how I will balance this blog and the new website. By no means will I stop blogging here, but I wasn’t sure which content I should put where. But then a solution occurred to me: when I post on Indonesiaful, I can post a link here too. So in the future, be looking forward to more links to Indonesiaful and more shameless self-promotion. In other news…. All continues to go well in Pangkal Pinang. I spent a whopping three hours actually in class all last week. Between doing immigration paperwork/visits and Idul Adha celebrations and moving the teacher office to a different building (I have my own desk now! ), I only went to class on Tuesday morning. The rest of the time I have been sitting with different groups of Indonesians, progressing in my acquisition of Bahasa Indonesia (and, to a certain extent, Bahasa Bangka), and attempting to refuse endless sweets as politely as possible. Caitlin, my housemate/fellow ETA/parter-in-crime, got a bike last week and she has been doing some exploring on her own. I am still getting around on foot and occasionally accepting motorcycle rides from eager students, though next month I hope to be a bit more mobile. Meanwhile, I stayed at home pretty much all day today and putted around on the Magical Internet. When Caitlin got home from early-morning exercising in Alun-Alun, I uploaded pictures onto her computer from my camera. This means that theoretically I should have more super-awesome pictures for your viewing pleasure in the near future. Tia, my new friend, is on the left in this picture. The water really is this color but brighter and incredibly refreshing. Yesterday I found myself in a car driving over an hour away to go look at an ex-tin-mine-turned-turquoise-lake. How I got into this situation was a series of happy circumstances, but for some reason I was not feeling like the good, happy ambassador that I feel like I should be whenever I step out my front door. In fact, I felt downright surly. Not wanting to accidentally make a jerk of myself while feeling thus, I decided to take some deep breaths and cultivate an attitude of gratitude. Here I was, in beautiful Indonesia in a car full of happy, chatty (albeit chatty in a language still pretty much incomprehensible to me save for a few words and the frequent use of my name, which contributed to my irritability) Indonesians who were all around my age. We were driving to see what turned out to be a spectacular sight. THIS is the kind of thing that I am here for, and I did not want my bad attitude to get in the way of taking as many photogenic selfies as possible. Tia and friends, who welcomed me on their trip to Danau Kaolin (pictured right). The rest of my fellow ETAs in Indo. You are all a great source of support and give comfort (most often in the form of laughter) when I need it most. Ibu Asro and Pak Elvan for being everything a counterpart should be in ways that are neither too much nor too little. Pak Ari for always being on call to help with house-related problems as well as bringing us the eighth man-made wonder of the world: high-speed, reliable Internet. Bu Manggo Caitlin’s friend and fellow teacher at SMK2, for being an all-around Good Person. You might not know it yet, but we are conspiring to connect you with scholarships that can bring you to the U.S….! The Uncle Daves and Tom Dilling for the tablet that makes this blog and my participation in Indonesiaful possible! Much love to you and all of Tampa; sorry I haven’t messaged back. Re: All Hallows Ball, of course you can give my invite away. I hope I can be back on the list someday. My parents for pretty much everything under the sun. Love you to pieces! My extended family for your boundless love and support, even when I am very, very far away. My support network at the University of Tampa — the list is long so I won’t start naming names but if you’re reading this you know who you are! Big hugs and I’ll be back to visit as soon as I can. AFS — without this organization I wouldn’t be here or dare to dream as big I do. The Fulbright Program, for making this crazy year possible! That lake looks awesome. Yes, seeing wonders of the world is fantastic, have fun. Well Ms Kelly Fitz, it sounds like things are coming along swimmingly in your far away digs . Your blog has us laughing and feeling informed about what your life is like inPPI. About those endless sweets you are declining, is there a chance you could send them back to your friends in Tampa? Not much has changed here, things are good. We’ve had lots of rain this summer and it keeps coming. I’m so proud that you’re taking on the “Indonisia blog”. We’re learning so much about the culture and the country . I’m looking forward to more of it . I think of you so often. Life around the Dave-stead is not quite as much fun without you.